Baldock Ladies do well in the North Herts Ladies Finals! Devon Cooper won the Singles and was also a member of the winning Triples Team along with Rose Castle and Shirley Page. On the down side Devon and Shirley were the Runners-up in the Pairs. On the Letchworth & District Finals Day Baldock had more success with Rob Demster winning the Mens Singles, beating Stuart Brown of Roston. The L&D Mixed Pairs was won by Jamie Claydon & Devon Cooper. Baldock men were also Runners-up in the Triples & Fours. A generally successful day for the club. The morning hosted the County League North Division Finals for both men and ladies. The ladies played 3 Horseshoes and swiftly moved into a 25 shots to nil lead. 3 Horseshoes made a comeback but conceded at 29 shots to 7. The men’s match against Royston was a much closer affair. For most of the match Baldock were 3 or 4 shots behind but a 6 shot pickup on one rink and two two’s on the other moved Baldock to a nine shot lead and Royston conceded. Both men and ladies will now play in the County League Semi-finals on Sunday September 17th Garston. Ladies Team from the left: Debbie Claydon, Rose Castle, Jan Turner (Capt), Val Bingley. Mens Team from the left: Brian Todd, Peter Roseblade, Rob Demster, Mike Parsons (Capt), Malcolm Ingram, Paul Haskins, Joe Morley, Max Mckinnon. While all this was going on the East Beds C team was playing in two finals at Flitwick. They lost the Champion of Champions Cup to Sandy Town but beat Sandy Conservatives to win the Knockout Cup. In the friendly match against Potton Baldock won on 4 of the 5 triples with a total score of 97 shots to 66, the top triple being Tony Snowball, Mary Gibbons and Brian Griffiths. More success for the Baldock club. In the Letchworth & District Cairns Cup they beat Royston to win the Cup for the second successive year. In the North Division League semi-final the men beat Letchworth GC and will now meet Royston in the final. The ladies also won their semi-final and will meet 3 Horseshoes in the final. The teams in the East Beds League have done exceptionally well. Both the B and C teams have won promotion and the C team will play in the Knockout Cup and Champion of Champions Cup finals this weekend. The ladies held the North Herts finals and Baldock had success in the triples with Devon Cooper, Rose Castle and Shirley Page. Baldock juniors acquitted themselves well in the National Finals at Leamington. Devon Cooper and partner lost in the semi-final of the ladies junior pairs but Max Mackinnon and partner went out in the first round of the men’s version. 12 year old Sam Andrews won his first round match in the junior singles but lost in the second round to a junior international. The Baldock men played Royston Bowls Club men in the Letchworth & District Cairns Cup triples competition on Friday evening. Playing two triples at home & two triples away, the Baldock men convincingly won by winning the two triples away and drawing one and losing one at home. They won with a combined total of 86 shots to Royston’s total of 60 shots. The Baldock team on the night were: Max Mackinnon, Brian Todd, Darren Hickin, Phil Page, Malcolm Ingram, Rob Dempster, Brian Griffiths, Paul Haskings, Jamie Claydon, Dave Turner, John Cosby and Mike Parsons. Saturday’s friendly was a four rink home match against South Mimms, which the club won by winning on three rinks and drawing on one rink. A mainly disappointing period for the men of Baldock. Firstly, losing to Harpenden in the semi-final of the County Knockout Cup and then losing to Romford in the National 2 Fours in the last stage before the National Finals. The ladies showed the way when they beat the Bedfordshire champions in the National Top Club competition, albeit on shot difference after the match finished with two wind each. The ladies will now play the Huntingdon champions. The men did have some success with a win over 3 horseshoes in the Cairns Cup and will now meet Royston in the final. In the East Beds League all three teams won their latest matches but the plaudits go to the C team who are in the final of the Champions Cup and the semi-final of the Knockout Cup. In the weekend fixture Baldock beat Whitethorn 76 shots to 71 with the top triple being Tony Snowball, Jayne Saunders and Doug Nicholls. The men’s team in the National 2 Fours beat Welwyn Garden City to become champions of Herts and Beds and will now play Romford for a place in the national finals at Leamington Spa. Already through to Leamington is Gary Wood who won the Hertfordshire section of the Senior Singles. The County finals produced mixed results for the club youngsters. Devon Cooper won the Ladies 2 wood singles but Sam Andrews had to settle for the runners-up prize in the men’s junior singles. In local competitions the men progressed to the semi-final of the Cairns Cup with a win over Letchworth Garden City and will now play Three Horseshoes. The Baldock quartet of Martin Roberts, Graham Cross, Rob Dempster and Peter Roseblade have won the Hertfordshire section of the new competition for senior players and will play at Leamington in the National Finals. They will be joined at Leamington by Max Mackinnon and his partner Dan Knight from the St Ippolytts club who have won the Hertfordshire Junior Pairs competition. Max was narrowly beaten in the semi-final of the County un-badged singles competition as was young Max Cooper who lost in the semi-final of the Under 30 singles. Another Baldock junior, Sam Andrews, has reached the final of the Junior singles where he will play last year’s county champion. Still on National competitions, the Baldock A team beat Garston in the National 2 Fours competition and will now play Welwyn Garden City in the Hertfordshire final. In the County League Baldock beat Norton on both rinks for a 6-0 victory and now play Howard Garden in the last match, having already secured a semi-final place. In the weekend friendlies Baldock played Henlow Park on Saturday and managed to lose on all four rinks. Sunday’s match at Potters Bar saw a return to form with wins on 3 triples and losses on 2 for an overall score of 91 to 67. It’s been a very busy couple of weeks at Baldock with most of the results going their way. Top of the list is the Ladies who defeated Hatfield to become County Champions. In a hard fought match Baldock won 3 of the 4 disciplines and will now play the Bedfordshire champions for a place in the National Finals. The men have had their successes too. They beat Royston in the Eversleigh Championship to reach the final of the North Division. The men also had success in the County League beating Whitethorn on both rinks and in the Cairns Cup they had a good win over Riverain. The National 2 Fours competition draw saw the two Baldock sides drawn against each other. After a close encounter the A side prevailed by a narrow margin. In individual county competitions Devon Cooper has reached the last 8 of the County Singles and Hannah Liddle and Sue Bard-Bodek the same stage in the Pairs. For the men Phil Riley and Peter Roseblade and Graham Albone and Jamie Claydon are in the last 8 of the Men’s pairs while young Max Mackinnon has reached the semi-final of the County Un-badged Singles. In the weekend friendlies Baldock beat Biggleswade St Andrews in all 4 triples on Saturday while the Sunday match against Bishops Stortford resulted in a win to Baldock by 3 rinks to 1. A very good week for the Baldock club. It all started on Monday when all three of the East Beds League teams recorded a victory, two against Shefford and one against Maulden. On Wednesday Baldock played St Ippolytts in a County League match and won on both rinks for a 6-0 points score. On Friday the club travelled to Rosedale in the Tony Allcock Trophy and won by 50 shots to 43. During the week further rounds of County competitions were played with the result that Rob Dempster and Nax Mackinnon are through to the last 16 of the County Singles. Max is through to the last 8 of the County Unbadged singles. In the pairs Dave Hoare & Rob Dempster, Peter Roseblade & Phil Riley and Graham Albone & Jamie Claydon have all won through to the last 16. In the National Mixed Pairs Devon Cooper & Bryn Evans had a last bowl win against a pair from Welwyn Garden City. However, the run came to a halt on Sunday when Baldock lost at Potten End by 3 matches to 2 in the National Top Club, only winning the pairs and the fours. Both the men and the ladies had wins in county and national competitions this week. The ladies beat Harperbury in the county Top Club whilst the men had a one shot win over Potten End in the national 2 Fours and will now meet the other Baldock team. In the Tony Allcock Trophy Baldock beat Riverain with a resounding victory on one rink and a draw on the other. In the weekend friendlies Baldock hosted Luton Coop on Saturday and won the match by 8 shots despite winning on only one of the 4 rinks that rink being Penny Chatfield, Warwick Brotherton, Spencer Deane and \Mike Wintrip. Fortune does last long and from being top rink on Saturday Mike Wintrip went to lowest rink on Sunday in an away match at Potton. Never the less Baldock won the match by 86 shots to 69, top rink being Mary Gibbons, Doug Nicholls and Brian Todd. Hasn’t gone too well for individual competitors so far but team events are much better. The ladies won their opening Top Club and will now play away at Potters Bar. The men won the first round of the County Top Ten at Hoddesdon and will now play St Albans Clarence Park this Friday. Both the mens teams in the National 2 rinks won their opening matches against Buntingford and Welwyn GC. The Over 60 2 mixed rinks narrowly beat Royston last night. Next rounds of all these competitions are on the board at the club so have a look and support your teams. On a completely different matter, some of you may member Harry Baker who joined us from Barnet. Harry passed away last November but his daughter has presented the club with his bowls, each set in a fairly good bag. - Henselite Classic De Luxe size 2. They are all in pretty good condition and are for sale to members. No reasonable offer refused and all profits to support the new junior academy. Bids to me please. A good week for the club but not so good for the individuals as all the men’s fours were beaten. On a brighter note both the men’s teams in the National 2 Fours progressed beating Buntingford and Welwyn Garden City reasonably comfortably. The ladies also had success beating Potten End in the Top Club competition. In the East Beds League both the B and C teams lost narrowly whist the A side did not play. At the weekend the club hosted Sandy Conservatives on Saturday and won on 3 of the 4 triples for a total score of 91 shots to 51, the top rink being Keith Wadsworth, Mary Gibbons and Dave Davies. On Sunday the club visited Shefford for the first time in many years and the match finished in a draw at 75 shots each Baldock’s top rink being Mary-Ann Haskings, Doug Nicholls, Jan Turner and Rose Castle. the B team over the A team. match by 75 shots to 60, Baldock’s top rink being Brian Leadley, Bill Baxter and Spencer Deane. Russell, Rob Dempster and Dave Turner winning by 39 shots. 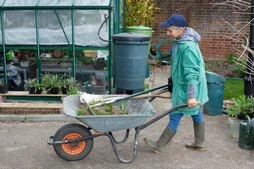 Despite the chilly weather the May Day Open Day at Baldock was a tremendous success. Almost 100 people came along and more than 20 have signed up for coaching prior to joining the club. Fours - Brian Todd, Martin Roberts, Darren Hichin & Mike Parsons. The first round of the County Triples produced a disappointment for two Baldock teams but three will contest the second round. On Saturday Baldock entertained St Albans Clarence Park and won on three of the four triple for a total score of 77 shots to52, the top team being Warwick Brotherton, Spencer Deane and Shirley Page. The Sunday match was against Trumpington and Baldock won by 97 shots to 83 despite only winning on 2 of the 5 triples. Top team was Doug Nicholls, Jan Turner and Steve Budge. The 2017 Summer season is nearly with us and the green this year is due to open at 2.00pm on Thursday 20th April & the Clubs open day is on Bank Holiday Monday 1st May. 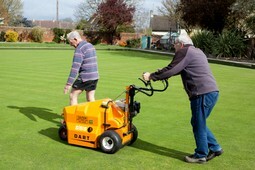 Members of the Greens Team at work in preperation for the greens opening. 10. Hon. Treasurer’s Report including proposals for subscriptions, match fees, etc.